Hallacas are a mixture of meat stew, topped with vegetables, raisins, capers, almonds and bacon all stuffed into a corn dough. Then, it's neatly wrapped in banana leaves. A Denver woman, Dalia Dorta Gonzalez, makes traditional Venezuelan hallacas every Christmas to pay homage to her home country. "As far as we know, the hallacas were invented by the slaves back in the colonial times,” Gonzalez said. 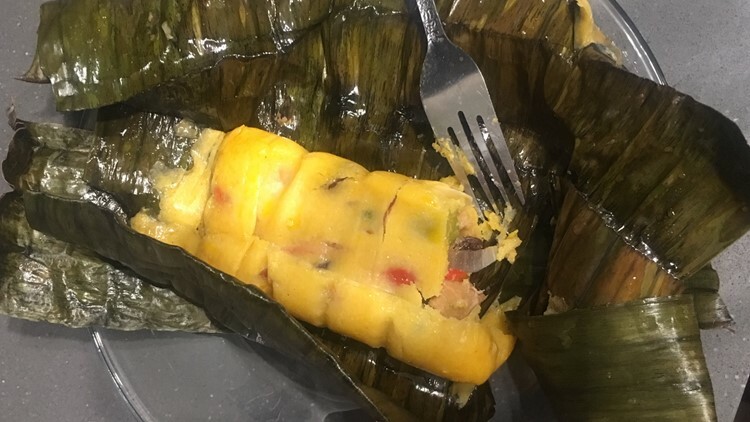 Gonzalez said the slaves would use whatever food leftovers they could find to make the hallacas, which are a mixture of meat stew, topped with vegetables, raisins, capers, almonds and bacon all stuffed into a corn dough. Then, it's neatly wrapped in banana leaves. 6 tablespoons of onoto seed. Water and salt to cook them. Clean the pork rubbing it with lemon and rinsing under running water. Cook it together with the bacon that is going to be used as an ornament, with enough water to cover them. Bring to a boil and cook for 7 to 8 minutes The pork should be pink. Turn it off and let it cool, the bacon is removed. The pork is cut into pieces of about 3 centimeters, removing the fat or any other disposable part it might have. Set aside and discard the liquid. Chickens are cleaned. Rub with lemon and wash well. Each chicken is placed in a large pressure cooker with enough water to cover. They are boiled and cooked for 35 minutes or until they soften, but not too much. Turn them off and let it stand for 10 minutes. They are removed from the pot and left to cool. The skin is removed. The meat is cut or crumbled into pieces. The broth resulting from the cooking the chicken is left to cool and stored in the fridge for use in the preparation of stew and dough. In a large pot, preferably made of stainless steel, place the oil, onion, leeks, scallion or green onions, and the crushed garlic with the capers mix. For the latter, bring crushed garlic, capers, and ½ cup of chicken broth to boil and cook for about 15 minutes, until it withers. Add the paprika, tomato, spicy sauce, wine, vinegar, Worcestershire sauce, piloncillo, dry paprika, dry chili, pepper, salt, 2 cups of broth and mustard. Bring to a boil and cook for about 10 minutes. The pork is added. It is boiled and cooked for about 40 minutes. The chicken is added. Bring to a boil and cook for 30 to 40 minutes, stirring occasionally. The seasoning is corrected, which must be very strong. Cover the pot with a cloth, let it cool in a cool place until the next day, when the hallacas are going to be filled. In a cauldron, put 2 cups of lard, with the onoto, bring it to a boil, cook it briefly and turn it off. The onoto grains are eliminated. That lard will be used to color the dough and grease the leaves. Mix the lard, dough, chicken broth and salt. Everything comes together and kneaded very well until it is soft and compact. It is placed on a large tray and covered with a damp cloth. The oven is preheated to 350 degrees. Spread the red peppers with the oil. They are put in the oven and baked for 50 minutes or until they begin to brown. They are taken out of the oven. They are placed on a damp cloth. They are wrapped and when cooling, the skin and seeds are removed and cut into strips of 1 centimeter, 4 to 5 centimeters long. The skin is removed from the almonds. Onions are peeled. They are cut into thin wheels. The capers and olives drain. All the ornaments are set apart. The bacon, already cooked, is cut into thin strips of 4 to 5 centimeters long. The leaves are classified according to size them into three groups. Those of about 40 x 30 centimeters; those of 25 x 25 centimeters for the top part or covers, and those about 10 to 15 centimeters wide for the length that the sheet gives transversely, for the strips or final wrap. The leaves should be washed with water and dried thoroughly. 1. The leaves should be greased before spreading the dough, for this, the lard colored with onoto is used. The final strips or covers are not greased. 2. Put a greased sheet on a table. In the center is placed a dough ball about 5 to 7 centimeters in diameter and on top of a piece of thick plastic and about the size of the sheet. It is pressed with a kitchen board making small circular movement towards each side so that the dough is very thin. The same is done with the covers but using less mass. The leaves with dough are placed separately. 3. Quickly put a sheet of dough on a flat plate, and pour in the center of the dough about 1/2 cup of cold stew. On top of the decorations: 3 onion wheels, 2 strips of red pepper, 2 strips of bacon, 2 olives, 2 almonds, 4 to 6 capers, and 6 to 8 raisins. 4. Cover with a smaller sheet with dough. With your fingers press on the edges of the filling to paste the two layers of dough. The two sides of the sheet are folded successively upwards and the two ends also upwards. It is wrapped again with the large leaf, without mass, and then wrapped with a sash. It is tightened carefully and tied with a wick, crossing it 3 times in each direction. It must always end in the center so that the mooring is safer. If any of the leaves is broken, the hallaca should be protected with another extra leaf before putting the belt on and fastening it, so that water does not come in when cooked. Carefully put in a pot with boiling water and salt so that they are covered. Place some leaves on top to keep them submerged, the pot is covered, it is brought again to a boil and boiled covered for 1 hour. They are removed and placed on a table, slightly tilted to drain. They are left to cool well and put in the refrigerator where they are stored for up to 4 weeks, however after the third week it acquires a lot of flavor from the leaf. 5. When they are going to be served, they are previously heated in boiling water with salt or in the oven, each wrapped in aluminum foil. To serve them, they are untied, their girdle and shirt are removed, they are placed on a board with the ends bent down and the leaves are cut by the edges with a blade. The piece of cut leaf is removed and left on the rest of the leaf in each dish that goes to the table. 6 cucharadas de semilla de onoto. Las hallacas, agua y sal para cocinarlas. Se limpia el cerdo. Se frota con limón. Se enjuaga bajo agua corriente y se pone al fuego conjuntamente con el tocino que se va a usar como adorno, con suficiente agua que los cubra. Se lleva a un hervor y se cocina de 7 a 8 minutos. El cochino debe quedar rosado. Se apaga el fuego. Se deja enfriar, se aparta el tocino. El cochino se corta en pedazos de unos 3 centímetros, quitándole la grasa o cualquier otra parte desechable que todavía tenga. Se pone aparte, se desecha el líquido. Se limpian las gallinas. Se frotan con limón y se lavan bien. Se pone cada gallina en una olla de presión grande con 5 tazas de agua. Se llevan a un hervor y se cocinan por 35 minutos o hasta que ablanden, pero no demasiado. Se apaga el fuego. Se deja reposar unos 10 minutos. Se sacan de la olla y se dejan enfriar. Se les elimina la piel. La carne se corta o desmenuza en pedazos. El caldo que resulta del cocimiento de las gallinas se deja enfriar y se guarda en la nevera para usarlo en la preparación del guiso y de la masa. En una olla grande preferiblemente de acero inoxidable, se ponen el aceite, la cebolla, el ajo porro, el cebollín, y el ajo triturado con las alcaparras. Se lleva todo a un hervor y se cocina por unos 15 minutos, hasta marchitar. Se agregan el pimentón, el tomate, el ají dulce, la salsa picante, los encurtidos, el vino, el vinagre, la salsa inglesa, el piloncillo, el pimentón seco, el ají seco, la pimienta, la sal, las 2 tazas de caldo y la mostaza. Se lleva a un hervor y se cocina por unos 10 minutos. Se agrega el cochino. Se lleva a un hervor y se cocina por unos 40 minutos. Se agrega la gallina. Se lleva a un hervor y se cocina de 30 a 40 minutos, revolviendo de vez en cuando. Se corrige la sazón, que debe ser muy fuerte. Se tapa la olla con un paño no muy tupido y sin que quede demasiado tapado se deja enfriar en un lugar fresco hasta el día siguiente, cuando se van a llenar las hallacas. En un caldero se pone parte de la manteca, unas 2 tazas, con el onoto, se lleva a un hervor, se cocina brevemente y se apaga. Se eliminan los granos de onoto. Esa manteca se va a usar para colorear la masa para engrasar las hojas. En una mesa o tabla se pone la masa y se le incorporan, la manteca, unas 3 tazas sin colorear y 1 taza coloreada y la sal. Todo se une y amasa muy bien. Se pasa por la máquina de moler para obtener una masa bien unida y compacta. Posteriormente se le incorpora el caldo de gallina, unas 3 tazas, y se amasa nuevamente, muy bien, hasta que quede suave y compacta. Se pone en una bandeja grande y se tapa con un paño húmedo. Se precalienta el horno a 350 grados. Se untan los pimentones con el aceite. Se meten en el horno y se hornean por 50 minutos o hasta que comiencen a dorar. Se sacan del horno. Se colocan sobre un paño húmedo. Se envuelven y al enfriar se les quita la piel y las semillas y se cortan en tiritas de 1 centímetro 4 a 5 centímetros de largo. Se quita la piel a las almendras. Se pelan las cebollas. Se cortan en ruedas delgadas. Las alcaparras y aceitunas se escurren. Todos los adornos se ponen separados, aparte. El tocino, ya cocido, se corta en tiritas delgadas de 4 a 5 centímetros de largo. Todos los adornos se ponen separados, aparte. Se pican las hojas clasificándolas en tres grupos de acuerdo al tamaño. Las de unos 40 x 30 centímetros 25 centímetros para la parte superior o tapas y las de unos 10 a 15 centímetros de ancho por el largo que da la hoja transversalmente, para las fajas o envoltura final de las hallacas. Las hojas deben lavarse con agua y secarse bien. se usaran para la parte inferior y también, sin masa, para hacer a la hallaca una envoltura de protección contra el agua. 1. Las hojas deben engrasarse antes de extenderles la masa, para ello se usa la manteca coloreada con onoto, con un pañito que se moja en la manteca. Las fajas o cubiertas finales no se engrasan. 2. Se pone una hoja ya engrasada sobre una mesa. En el centro se le coloca una bola de masa de unos 5 a 7 centímetros de diámetro y encima un pedazo de plástico grueso y más o menos del tamaño de la hoja. Se aplasta fuertemente con una tabla como las usadas en cocina y al hacer Presión con las palmas de las manos se le da a la tabla un pequeño movimiento circular hacia cada lado para que la masa quede muy delgada. Igual se hace con las tapas pero usando menos masa. Las hojas con masa se van colocando aparte. 3. Sin esperar mucho, se pone una hoja con masa sobre un plato llano, y con un cucharón pequeño se vierte en el centro de la masa alrededor de 1/2 taza de guiso ya frío. Encima se colocan los adornos: 3 ruedas de cebolla, 2 tiritas de pimentón, 2 tiritas de tocino, 2 aceitunas, 2 almendras, 4 a 6 alcaparras, 6 a 8 pasas. 4. Se tapa con una hoja más pequeña también con masa. Con los dedos se presiona por las orillas del relleno para pegar las dos capas de masa. Se doblan sucesivamente los dos lados de la hoja hacia arriba y los dos extremos también hacia arriba. Se envuelve nuevamente con la hoja grande, sin masa, y luego se envuelven con una faja. Se aprieta con cuidado y se amarra con pabilo cruzándolo 3 veces en cada dirección. Se debe terminar siempre en el centro para que el amarrado quede más seguro. Si alguna de las hojas se rompe debe protegerse la hallaca con otra hoja extra antes de ponerle la faja y amarrarla, con el objeto que no le entre agua al cocinarla. Se meten con cuidado en una olla con agua hirviendo con sal de manera que queden cubiertas. Se les colocan por encima unos pedazos de hoja para mantenerlas sumergidas, se tapa la olla, se lleva nuevamente a un hervor y se hierven tapadas durante 1 hora. Se sacan y se colocan sobre una mesa, ligeramente inclinadas para que escurran. Se dejan enfriar bien y se meten en la nevera donde se conservan hasta por 4 semanas, sin embargo después de la tercera semana adquiere mucho sabor de la hoja. 5. Cuando se van a servir, se calientan previamente en agua hirviendo con sal o en el horno envuelta cada una en papel de aluminio. Para servirlas, se desatan, se les quita la faja y la camisa, se colocan en una tabla con las puntas dobladas hacia abajo y se cortan las hojas por los bordes con una hojilla. Se elimina el pedazo de hoja cortado y se dejan sobre el resto de la hoja en cada plato que va a la mesa.